The familiar bass line and melody riffs from this Mancini classic adapt perfectly for jazz combo in this easy arrangement by John Berry. Simply fun to play and to listen to! The perfect jammin' tune for opening up the solo section. 11 Dixieland-Arrangements, in variabler Besetzung spielbar. Set mit den Stimmen Klarinette, Trompete, Tenorsaxophon, Posaune, Gitarre, Klavier, Bass und Schlagzeug. 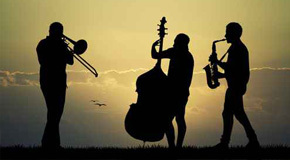 From jazz quartets to funk bands - with over 1,350 combo sheet music titles, we can offer you a large selection of original works and arrangements for rhythm sections, combos with singing and with up to 5 or more wind instruments from jazz, Latin, funk, rock, hits, Dixieland and dance music. Here you will also find original transcriptions from Tower of Power, Michael Bublé and much more.